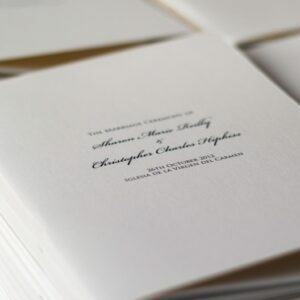 Our Wedding Mass Booklets printing service is only produced on quality paper. We know that your Wedding Mass Booklets are an intricate part of your big day and we understand that every detail has to be perfect. So let us take out the stress out of designing your Wedding Mass Booklets so you can get to other essential things. Wedding Mass Booklets are printed in A5 size booklets which is A4 folded. We can custom design, print, fold and saddle stitch your Wedding Mass Booklets at a very affordable price. The great thing is you can print your Wedding Mass Booklets printed black and white or in full colour at no additional cost. When comprising your Wedding Mass Booklet, please ensure they are to be in multiples of 4 i.e. 12, 16, 20 pages and so on. For further information or queries please feel free to contact us.